You will recall that last week we left Huronia being continually raided by the Iroquois. The Tobacco Nation lived to the west and the Neutrals the southeast. Although these three outnumbered the Iroquois four-to-one fire arms gave the latter such a tremendous advantage that the former had no chance. This tactic of raiding the Iroquoian speaking peoples of Southern Ontario and stealing their pelts to trade with the Dutch continued for a few years. Father Jerome Lalemant complained in 1647 that each year the ambushes of the Iroquois had resulted in the massacre of a considerable number of “savages” allied to the French. Finally the Five Nation Iroquois decided to take the rich beaver grounds of Southern Ontario for themselves by force of war. Below is a map of Huronia in 1636 done by Andrew Frederick Hunter. To zoom-in right-click on the image then right-click again to enlarge. In 1648 the mission of St. Joseph suffered a surprise attack. The Christian converts were celebrating mass and the traditionalists were in their cabins. The Huron resisted as best they could but were soon overcome. The Iroquois set fire to the village and massacred the helpless-men, women and children alike. Father Daniel, who was in charge of the mission, saw that all was lost so he ran to the longhouses baptizing all he could. He believed that if their lives were lost at least their souls would be saved. When the Iroquois reached the church the good Father went out to meet them. This gave the inhabitants still alive a chance to escape, which many did. Many more were killed, especially young mothers slowed down by the burden of their infants. Father Daniel was quickly overcome by gun shots and his naked corpse was thrown into the flames which were consuming the church. About 700 Huron were massacred at St. Joseph that day. Many more escaped and most fled to St. Marie. Many of the other missions suffered similar fates that year. In the fall of 1648 the Jesuits were maintaining eight missions in the country of the Huron. Some reinforcements has arrived from Montreal and this served to give the Fathers new courage. But just when they thought things would turn around the other shoe dropped! In the spring of 1649 the Iroquois were back with 1200 well-armed warriors. They made a sudden attack at daybreak on the mission of St. Ignace. This was only about ten miles from the main mission of St. Marie. St. Ignace was taken almost without a fight. Most of the inhabitants were sleeping so most were slain or captured. The victors quickly moved on to the mission of St. Louis which was on the road to St. Marie. The few warriors defending St. Louis were quickly overcome and the village burned. The Iroquois cast all they could not take with them as prisoners into the flames. Again, this included the old, the sick, the wounded and little children. It was here that two of the more famous martyrdoms of the war occurred. Fathers Jean de Brebeuf and Gabriel Lalemant refused to abandon their charges. They were captured along with most of the converts and their captors vented their full rage on these two. They were tortured beyond all others suffering several excruciating torments over a long period of time until they finally succumbed. The Iroquois planned to advance to St. Marie but their advance guard suffered a partial defeat so they decided to abandon that plan and return home. They had taken too many captives so they kept as many as they could and the rest were burned to death. Due to the relentless attacks of the Iroquois, the worst famine in fifty years and the sickness that filled the land Huronia was filled with consternation. Fifteen villages had been abandoned and the survivors had fled northward. In less than a year St. Marie had taken on 6000 refugees. In the spring of 1649 the Black Robes decided to abandon that mission. Most fled to the north to seek refuge with their Ottawa friends on Manitoulin Island. About 900 went to the Island of St. Joseph, which today is Christian Island, with the Jesuits. They had planned to set up a new mission called St. Marie II, but the island could not support that many refugees so the plan was abandoned. The Christian Huron returned to Quebec with the Jesuits and the traditionalists joined the other refugees at Manitoulin. They would later move to Michilimackinac and become known as the Wyandotte. The French had called them Huron from an old French word meaning ruffian. This new name is a corruption of the name the Huron called themselves, Ouendat. Below is a map of the region after the destruction of Huronia. The Saulteux, Amikwa, Nippissings and Mississauga are all Ojibwa. Hi Everyone! Well another Wednesday is here and it’s time to find out how our poor Huron people are going to fare. We left them last week languishing in sickness and famine. One of the difficulties the Black Robes brought to their new mission field was division. The coming schism in the Nation would set one Huron against another. This would only serve to weaken a once proud and powerful people. The Church considered a Christian to be anyone partaking in the sacrament of Baptism. Not all were so inclined. Many preferred to remain true to their father’s religion thus exasperating the good fathers. In history these obstinate ones were referred to as traditionalists. However, the Jesuits at the time were not so kind to them either in name or in deed. Father Peron cried out to his superiors back in Quebec that their holy men were the devil’s religious, their traditional practices no more than deviltries. Their medical practitioners he labeled as sorcerers and their instruments charms. Their staunch belief in dreams he called idolatry, master of their lives and the god of the country. Needless to say the traditionalists were looked down upon. On the other hand those who converted were given preferential treatment. The fathers duty was to look after the Christian Huron, to heal their diseases both of soul and body all to the great advancement of Christianity. According to Father Ragueneau the new converts all seriously attended to their soul’s salvation and this clearly banished vice. Virtue ruled in the new Church at Huronia and it was seen as the home of holiness. To the Church it became a black and white issue. The convert was in the Kingdom of God and the rejectionist the Kingdom of Satan! Preferential treatment was not limited to the Church. The state also indulged in the practice. Trade practices influenced by the Society of Jesus gave converts preferential prices for their pelts. Much worse was French trade policy regarding firearms. Guns were not traded to the Huron except in extraordinary circumstances. If a convert proved himself sincere over a long period of time he could procure a gun upon his priest’s recommendation. Needless to say there weren’t many muskets the fair land of Huronia. Not so in the land of the Five Nation League of Iroquois. They had been trading furs for guns for a long time with the Dutch without restrictions. This of course gave them quite an advantage over their neighbors to the north. Father Barthelemy Vimont wrote the bishop that the Mohawks had about 300 arquebuses and were making incursions into the country to north. The Huron, who were going to Montreal for trade and not for war, had not one gun. So when met by a party of Iroquois their only defence was to abandon their pelts and flee. The French blamed the Dutch accusing them of putting the Mohawks up to these raids. They thought that it was the Dutch’s design to have the French harassed by the Iroquois to the point of giving up and abandoning all. The French misunderstood. What they didn’t know was the Iroquois trapping grounds south of Lake Ontario were becoming depleted. Years of trade had taken its toll and new beaver grounds had to be found. Up to now these raids were only designed to rob the Huron of their peltry in order to continue trading with the Dutch. All of these things, the sickness, the famine and the schism causing the lack of firearms were coming together to make the perfect storm. The last of the calamities is about to visit the Iroquois’ cousins to the north. NEXT WEEK: Can the Huron Survive? This week I’m starting a post on Huronia and the great change it had undergone by the middle of the seventeenth century. Indeed, the whole of Southern Ontario had undergone tumultuous upheaval. But first let me describe the first contact between the Iroquoian speaking peoples of Southern Ontario and the Europeans. To give you some context check the map from my last post. 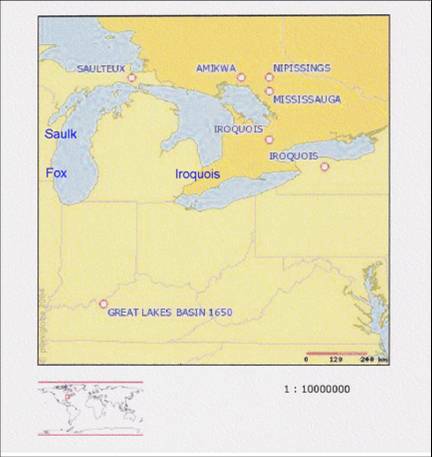 As you can see in the first half of the century the Huron Nation were living between Georgian Bay and Lake Ontario. The Tobacco Nation were living just west of them in the area of the Bruce Peninsula with the Neutral Nation occupying the territory north of Lake Erie. But the first to see the bearded, pale skinned men were the Huron. Samuel D. Champlain made his way to Huronia via the Ottawa River. A sharp left at the Mattawa River, a short portage to Lake Nipissing and down the French River to Georgian Bay brought him to the outskirts of Huronia. This would quickly become the preferred trade route to Montreal and far superior French trade goods. Never slow at recognizing an opportunity to save lost souls the Church sent its most ardent evangelists, the Jesuits, back to Huronia to show these poor devils the way to Paradise. And they didn’t mind the arduous, month-long trip either. In 1637 Father Jean de Brebeuf wrote in his instructions for arriving Jesuits that they had to try to eat at daybreak because the day was long and the “barbarians” only ate at sunrise and sunset. He also said of his own journey there that he was on the road for 30 days of continual hard work with only one day of rest. Not a trip for the faint of heart! Huronia, he tells us, was a thriving country of about 20 towns with a population of 30,000. At first the outlook for the new relationship between these very different peoples looked bright. Trade was good and this pleased the Governor who represented the state. Conversions were being made pleasing the Bishop who represented the Church in New France. But all was not well in the land of the Huron. There was a foreboding sentence at the end of his very first letter that foreshadowed a calamity to come. Smallpox and measles! Dreaded diseases in the seventeenth century. Even more so for the poor Huron. The Europeans had struggled with these maladies for centuries and had built up some immunity. But not the peoples of the New World. They had no immunity. The Jesuits believed their immunity to be a gift of God and blamed the sickness on the “deviltry” practiced by the Huron. They continued to tend to the sick and reported back to their superiors that the sickness had grown more general and widespread. Father Francois Joseph Mercier reported in 1639 that of the 300 conversions at his post that year 122 people were sick! All this sickness produced another critical problem for them, famine. There wasn’t enough healthy people to tend the fields or go on the hunt to produce the amount of food required to support the population. So, only a few short years after meeting their saviors from the east the mighty Huron Nation was languishing in sickness and famine. Two calamities had befallen them. Would there be a third? Stay tuned next week to find out! 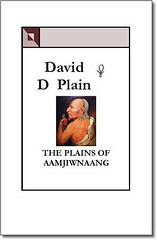 You are currently browsing the Books by David D Plain Blog blog archives for November, 2009.